I love working with five-year-olds. I love their creativity, their fearlessness, their willingness to try new things, their crazy imaginations, and the way they make everything silly and fun. Five just might be my favorite age. Some suggest that thinking like a five-year-old is beneficial for creativity, leadership skills, and growing a business (source). After all, five-year-olds are about as creative as they come (try asking one to explain why the sky is blue). 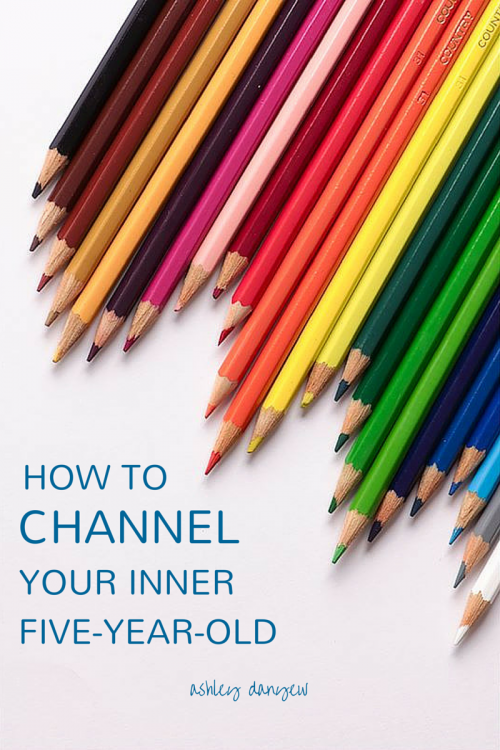 Next time you need a fresh spark of creativity or you want to see the world from a new perspective, channel your inner five-year-old. Have you been around a five-year-old lately? They ask lots of questions. Want to challenge the status quo? Ask more questions. Want to understand the heart behind that decision? Ask more questions. Want to create something unique and innovative? Ask more, well, you know. When was the last time you took out a blank sheet of paper and drew something? Instead of brainstorming in front of your computer, grab a pencil and start drawing. Bonus points if you use crayons or colored pencils. One of the hallmarks of creativity is fluency—finding more than one way to do something (source). Five-year-olds are masters at this. Next time you sit down to create, don't stop at the first version. Create at least three variations on that idea. Another component of creativity is flexibility—seeing an idea (or problem) from multiple perspectives (or with multiple solutions) (source). Focus on finding a number of ways to solve the problem rather than just being satisfied with one. What if there was no box? Ignore the boundaries for a minute and think what would be possible if there were no rules. This is where originality comes in—the ability to come up with unique ideas (source). So, you stepped out the box. You have a ground-breaking idea (with a few variations, like we talked about above). Now, sketch out some details. This is the fourth component of creativity - elaboration (source). Take your work to a new location this afternoon. Add some color to your project. Bring cupcakes to staff meeting (because, Thursday).